A Painting in Cellophane or plastic wrap. Download the painting from the internet, in this instance Het Melkmeisje by Johannes Vermeeer from the Rijksmuseum Amsterdam Collection and a silk texture from Pexel.com. Start with the picture of the painting. 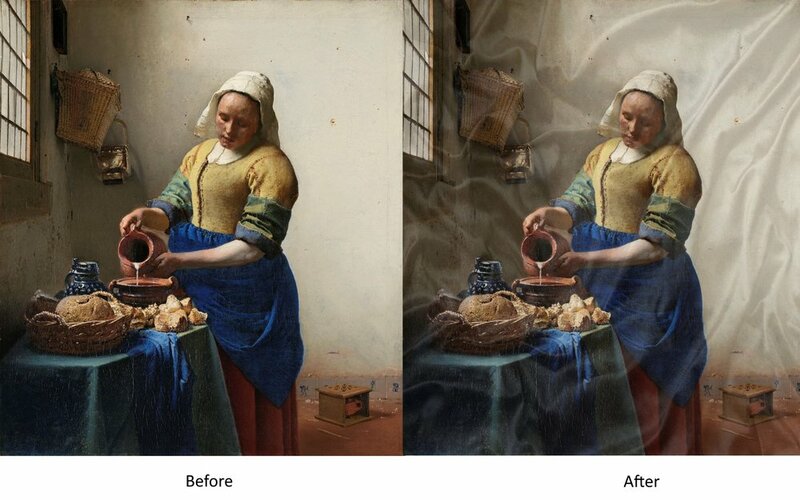 Select and copy and use as a new layer the silk texture on top of the Vermeer. Lower the opacity to somewhere between 75 and 60. The bottomlayer( the painting) is clearly visible but has lost its brilliance. 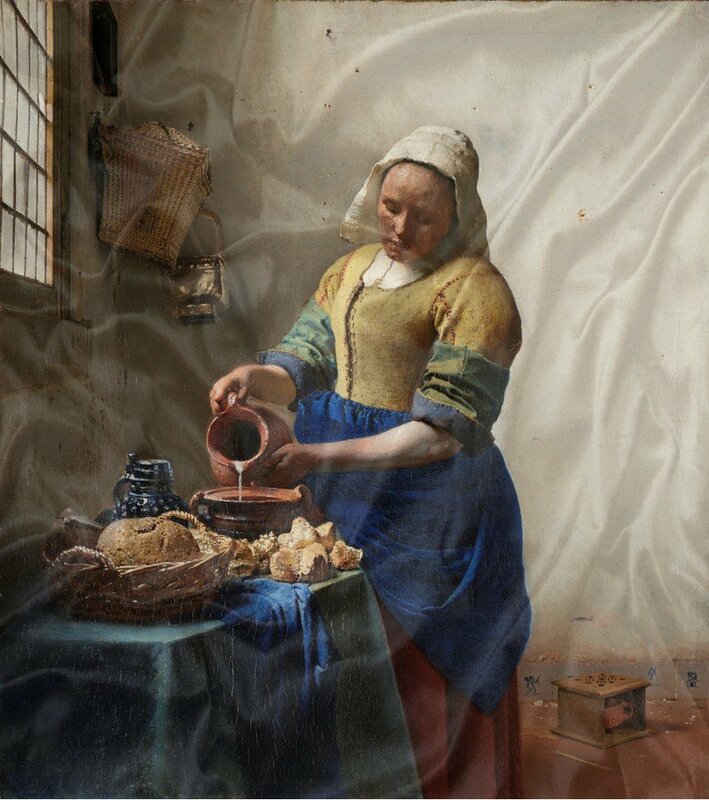 To bring the brilliance back copy the bottomlayer five or six times and merge the layers of the painting down.Finally merge the transparent silk layer down with the painting and you will end with a work of art in cellophane. I had a go at your suggestion and I downloaded a white silk background instead of a black/grey one. This meant that I didnot need to lower the opacity so far down as in the orginal attempt but when I used the multiply function the texture in the foreground disappeared. So I will stick to my original method. I also tried the free cellophane wraps from https://www.google.nl/url?sa=t&amp;rct=j&amp;q=&amp;esrc=s&amp;source=web&amp;cd=4&amp;cad=rja&amp;uact=8&amp;ved=2ahUKEwj2uqePs7XeAhWOGuwKHR41BtoQFjADegQICRAB&amp;url=https%3A%2F%2Fblog.spoongraphics.co.uk%2Ffreebies%2F6-free-high-resolution-plastic-wrap-textures&amp;usg=AOvVaw2Wtp3d79yENePxMiFsA2gF but they are dark as well.